Kombucha tea is a carbonated and fermented drink whose origins can be traced back to China during the third century B.C. This tangy tea drink is produced by combining oolong, black or even green tea with sugar, bacteria, and yeast to start a process of fermentation. The fermented tea is a popular beverage to boost energy, but when you’re breastfeeding or pregnant, it may not be the best drink for you. Drinking kombucha tea during pregnancy can actually even be hazardous. The process of fermentation produces alcohol levels in the tea that could be highly elevated. According to WebMD, certain kombucha tea creators have been brought to the attention of the U.S. Alcohol and Tobacco Tax and Trade Bureau (TTB) to modify their product due to high quantities of alcohol. CDC Says “Kombucha not safe for women”: It’s advised that healthy individuals consume just four ounces of kombucha tea each day. Two women died in 1995 after consuming more than what is now recommended. The Centers for Disease Control and Prevention (CDC) contend that there’s a link between the tea and the deaths. Because of the number of unanswered questions surrounding the tea and the associated deaths, the CDC says that those who are breastfeeding, pregnant or suffering from chronic health conditions abstain from consuming the beverage. Fermented Foods Unsafe for Pregnant Women: The United States Department of Agriculture (USDA) routinely evaluates kombucha producers and haven’t found any pathogens during these inspections. According to the CDC, the risk of a pathogenic organism penetrating the tea is still a danger. With even the best safety measures, mold has been found on the tea during inspection time. The molds are usually not hazardous, but the danger still remains that they could prove dangerous. Fetal Alcohol Syndrome: Unlike a lot of other drinks, kombucha tea continues to ferment even when the tea is done being bottled and placed on shelves. This shows that the alcohol levels can keep rising if it sits unopened for extended periods of time. 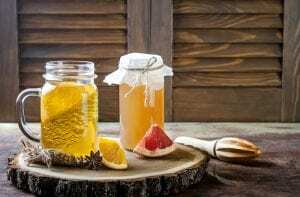 In spite of the dire warnings from many world-renowned agencies like the CDC, the USDA and venerated medical sites like WebMD, a lot of pregnant women feel that the dangers of consuming kombucha tea do not outweigh the potential advantages. Kombucha tea has been thought to offer a number of health benefits during pregnancy for centuries, particularly during the initial trimester. Detoxify: A lot of the advocates behind kombucha feel that it helps eliminate potential toxins. The tea is also thought to help stop the body from taking in toxins. Boost: Consuming the tea is thought to offer a boost of energy through the increase of hemoglobin numbers and the improvement of oxygen supply in your blood. It also seems to prevent the intake of non-heme iron. Blood Pressure: Helps lower blood pressure, even when pregnant. Immunity: Kombucha tea holds high amounts of vitamin C, which has been proven to help promote immunity. Ulcers: When you drink it regularly, the tea is believed by many to lower the chance of the development of ulcers through the reduction of gastric secretions. Nervous System: It’s rumored to lower depression, nervousness, epilepsy attacks and headaches. Antioxidants: The tea is a potent source of rich antibiotics. “Kombucha tea is a drink that shouldn’t be consumed by lactating or pregnant women. If the immune system is quite fragile already, you’re not going to want to mess with something unpasteurized unless given the go-ahead from your doctor,” mentions a board-certified gastroenterologist, Dr. Chad Gonzales. “After it gets put on store shelves, it keeps fermenting and this process of fermentation enhances the amount of alcohol. It increases to a level more than is allowed, which is .5 percent. It can grow to double or triple in certain cases. The public should be aware of what they’re buying,” Noel Rivers, a lawyer specializing in consumer protection, states. Until more research is performed on the various health concerns of kombucha, the majority of medical experts recommend their breastfeeding and pregnant patients to stay away from the effervescent tea.